The whole android story behind this posts revolves around a single concept - the UI Thread. Lets understand what is this UI thread and what makes it so important. Each application has a main thread which is also called UI thread. All the application components that are a part of same process will use this same UI thread. All the android life cycle methods, the system callbacks, user interactions etc are handled by this UI thread. Now you see why this main thread (UI Thread) is so important. You should avoid performing expensive time consuming operations on main thread as it will block your application altogether. This is one of the reasons why you may see ANR (App not responding) messages on you android device. Note : Generally all components in an android application will run in same process unless you explicitly specify components to run in different processed in the manifest file. 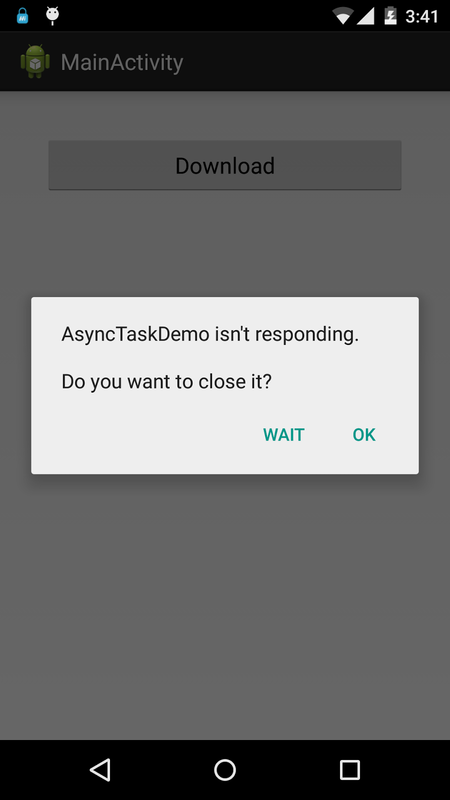 So in this post we will see how to run your time consuming processes in Async task which basically runs your time consuming process in a new thread. Why you should not do time consuming processing on UI Thread? I am creating a simple that has a download button. To simulate a time consuming operation I am simply going to make the main thread sleep for 5 seconds. So there you go. You got an ANR (App Not responding). This means your code is very bad and poor quality. 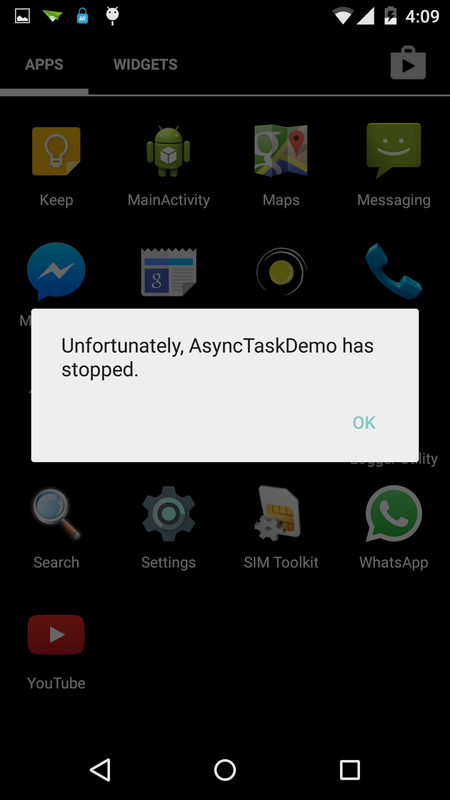 Now lets see how we can make use of Async task to get rid of this ANR. I am going to slightly change the code now. Will add a textView at the top which will show the download status - stop, progress and completed. Ok Go ahead and install the app and click on the download button. Opps! Your app would crash with following error. 04-12 16:05:51.241: E/AndroidRuntime(11317): Caused by: android.view.ViewRootImpl$CalledFromWrongThreadException: Only the original thread that created a view hierarchy can touch its views. Note : Only the thread that created and rendered a View can alter it and that thread is main UI thread. 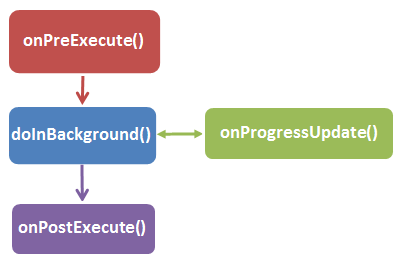 As I mentioned before Async Task starts a new thread and doInBackground method essentially runs in that thread. So you cannot update any of the UI elements from this thread. You can only do that from UI thread. Next natural question would be how will that be possible? Is there a callback? Well, there are. There are other methods in AsyncTask that we can override to leverage it. For example methods like onPreExecute(), onProgressUpdate() and onPostExecute() run in UI thread and can be used to update the UI elements. Instead of making thread sleep for 5 seconds in one go I am going to make thread sleep 5 times each for 1 sec to show how onProgressUpdate() methods works. I will override onPreExecute(), onProgressUpdate(), and onPostExecute() to show how they work. Typically I will update the downloadStatus TextView that we had in above code with corresponding download status. Note : Skipping few screenshots here. You should see update progress at 20%, 40%, 60% and 80%. Notices the generics in Aysnctask definition? - class DownloadAsynctask extends AsyncTask<String, Integer, Boolean>. doInBackground() methods returns to onPostExecute() methods. You can see - return true; in the doInBackground method and protected void onPostExecute(Boolean result). doInBackground() may call publishProgress() as we have used above which will make a call back to onProgressUpdate() to update the progress of background thread. Difference between functions and methods. Let me be honest here. I always thought they are the same and used them interchangeably but as it turns out they are not. Each has it's significance or scope. I stumbled on this question today when I started with python again after a long time. I simply googled "methods in python" and the results on different pages were using different terminology. And that's when it struck me that methods and functions are indeed different and we should be careful to use each in proper context. I will tell what to use it context of few programming languages but lets start with the understanding process. Ever tried to explain anyone what a method or function is ? You may have read some definition back in college. Anyway lets try to explain that first. So a function has a name (called as function name). There it has the data that is passed to it that the function can operate on (called arguments). There arguments are generally provided in parenthesis "()" adjacent to the function name. And lastly there is method body that has the logic to execute when this code module is called. If you ask about a method you may probably answer the same way. Functions are standalone where as method are associated with an Object. When you call a method it is in scope of that object which has it's own blueprint (called class). Another difference is that all arguments in function are explicit where as method had one implicit argument and that is reference to the object that the method belongs to. For example methods in Java can use this in the method body or in python you can use self. 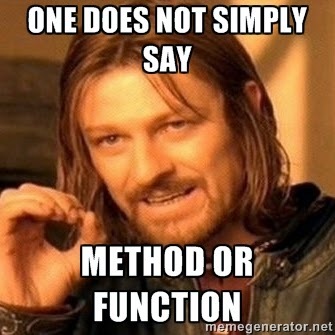 Just think of "Methods" as object oriented way of calling "Functions. I will give example in python due to which this all started for me. We can have both functions and methods in python. Hope it helps to understand this better.
""" This is a test function"""
""" This is a test method """
For Java, there are only methods. For C, there are only functions. For C++ or Python it would depend on whether or not you're in a class. Note : I know I have labelled this post as "programming concept" but it is more of a terminology use. There were many instance when I answered on Stack overflow using these words interchangeably and ended up corrected by someone and each time I am like "What.... how does it matter?". Well it does .. specially when you are in a circle of programmers/developers. So better late than never :) you know now! 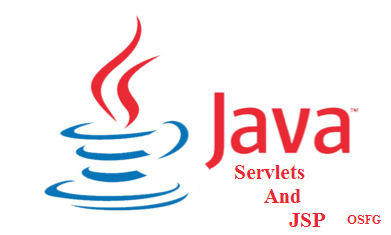 Both JSPs and Servlets are server side technologies based on Java to generate web content dynamically that is then rendered on the requesting client which is typically your web browser. In this post we will see How JSPs work and what is exactly the difference between JSPs and Servlets. So when ever tomcat server receives a request for URL like http://localhost:8080/projectName/HelloWorld you should see response as Hello World! in bold on a webpage that is rendered on your web browser. As I said before think of a servlet as Java module that intercepts HTTP request and provides the response for it. It is like HTML in Java . As you can see it is HTML content with embedded Java logic. Lets now see how JSPs actually work? When JSP container gets request for a JSP (Request URL would be something like http://localhost:8080/projectName/greetings.jsp) it checks whether JSP is compiled or not. If it is compiled it check for last modification time. If JSP page is modified after the JSP was previously compiled then JSP will be compiled again. Before compilation JSP is actually converted to a java servlet. This generated content is in Java just like a normal servlet we saw above. This servlet is then compiled into a class file. Request is then forwarded to this generated servlet which then handles the request and returns the response.